Plassey (West Bengal): This was the place where India lost its independence to the British East India Company after the Battle of Plassey, when the last Nawab of Bengal, Sirajuddaula, lost to Lord Clive after being betrayed his trusted general, Mir Jafar. Plassey, located on the Nadia – Murshidabad district border, on Thursday saw over 15,000 farmers and agricultural workers marching from Loknathpur and Ramnagar Ghat area of Murshidabad district and converging at the Aleya High Madrasah ground, demanding the immediate redistribution of 7,000 acres of Plassey Sugar Mill land and an end to the “pact between industrialists and the state government” to rob farmers of their rights. 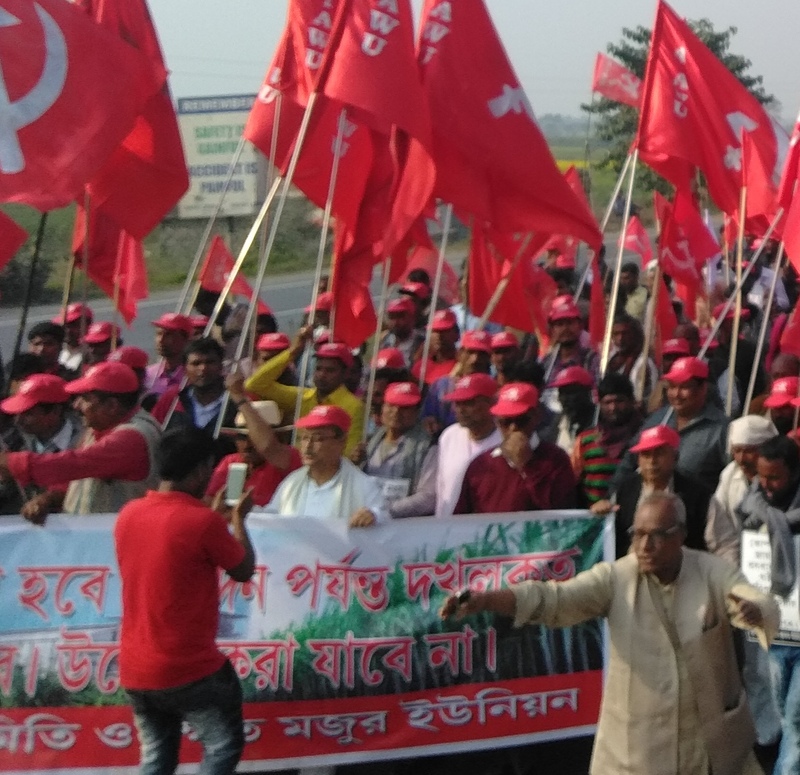 The ‘long march’ was held at the call of the West Bengal units of the All India Kisan Sabha (AIKS) and All India Agricultural Workers Union (AIAWU). The entire ‘long march’ route of five kilometres along NH 34 was covered by red flags, with the marchers defying the police and administration by stalling one side of the highway traffic for over an hour to register their protest. 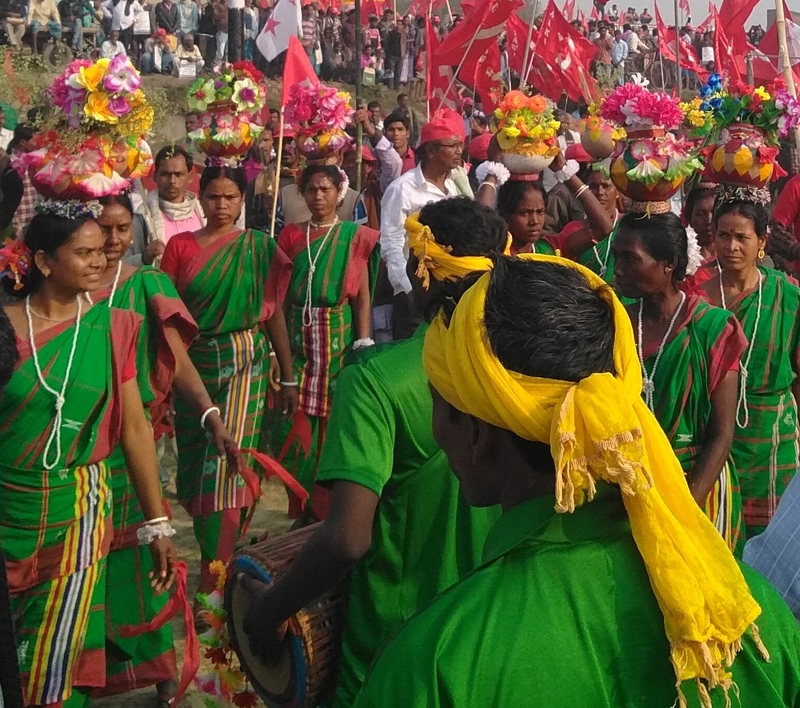 The farmers and agri workers who took part in the march came from Bhagabangola, Jalangi, Lalbag and Domkol block of Murshidabad and mostly belonged to the minority community. Led by AIKS state leaders Nripen Choudhury, Mriganka Bhattacharya, Abu Bakkar, Yunus Sarkar and AIAWU leader Insaf Ali, the marchers demonstrated their anger towards the policies of the Centre and State government through slogans, dances and songs. Khalilur Rehman, 65, from Jalangi, Abu Hosssain from Domkal area of Murshidabad district, Abul Hossain, Secretary, of AIKS Islampur block, narrated stories about how the TMC government and police combine were slapping false cases on anyone protesting against the alleged smuggling of government-provided seeds by ruling party activists. They also alleged that TMC members had forcibly taken over panchayats in Murshidabad where the Left parties had ground support. Recall that in Murshidabad district in the last Assembly elections, even after friction within the Left Front, TMC had managed to win only four seats out of 22. However, during the panchayat elections, the police threw the Left candidates out, the farmers who spoke in the rally alleged. “In the upcoming polls both the police and TMC will get a taste of the soil of Murshidabad,” said Mojjammal Sheikh, a farmer from Domkal block. 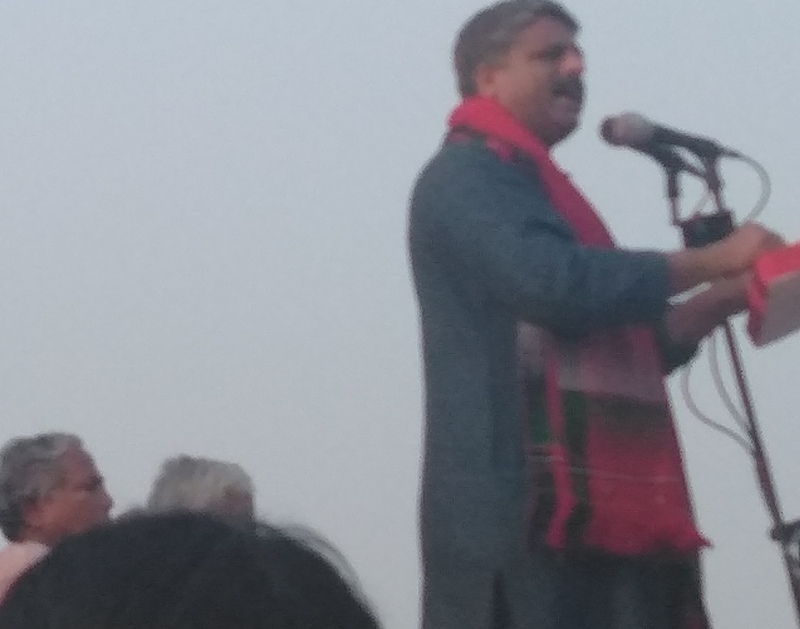 Addressing the rally, AIKS leader Vijoo Krishnan said Bengal’s Tebhaga movement, Kerala’s Punapra Vaylar and the historic Telengana struggle had made peasantry realise that it was only the Leftists who stand with them in their struggle for their rights, which have been consistently been violated by the indifferent policies of successive pro-rich governments. Krishnan cited the case of Andhra Pradesh where 53,000 acres of agricultural land was being taken over by the government or in Bihar’s Sitamarhi, where bombs were thrown at fasting women workers of the peasant movement. “Everywhere, AIKS is leading the farmers’ struggle, which has also initiated a change in the state government in BJP strongholds in North India,” he said. In NewsClick's Daily Round-up, we look at some of the trending as well as not-so-trending news from a different perspective.